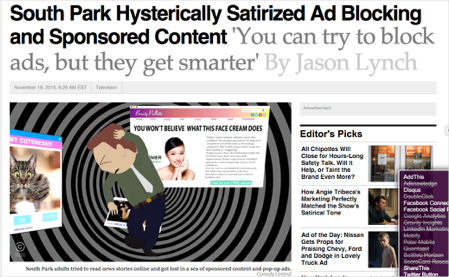 This post was selected by the editors of Context as one of the best posts about the marketing and advertising published on Medium in 2016. Together, they created a vision of the future, one so well thought out and rendered in the film, that we have been trapped in it ever since, having unfortunately forgotten it was supposed to be terrifying. In the key advertising section we see Tom Cruise as John Anderton walking down a corridor, being scanned by retinal cameras, assaulted from all sides by aggressive holographic billboards for Lexus and Guinness, all calling out his name in a cacophony of commercial exhortations. Watching the scene, the tension, the unpleasantness of the assault, is palpable. Sensors identify you by the unique patterns of blood vessels in your retina, analyze your emotional state based on other biometric data, tailoring the ads with your name and a highly intrusive, personalized pitch. The development being discussed in all of these pieces is the dynamic personalization of advertising, the topic under consideration. In order to frame this discussion, we need to separate marketing from one of its Ps: promotion, specifically advertising. The marketing function has been diminished, from establishing the right mix of products, pricing, place and has come to largely oversea the ever increasing complexities of promotion. This has conflated our understanding of marketing. Opt-in personalization of products and services can provide new value opportunities for customers and companies, but ‘personal advertising’ misunderstands how advertising works, and even what it is. 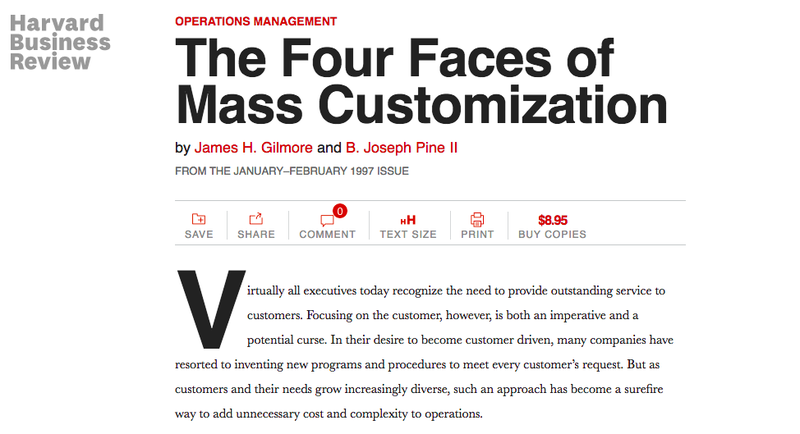 The Age of Personalization, in the form of the mass customization of products and services, has been in effect since the 1990s and has been highly successful across innumerable categories. 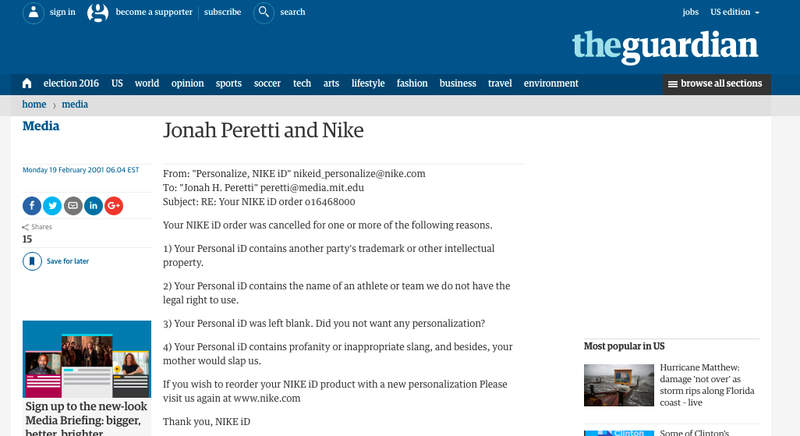 Jonah Peretti, founder of Buzzfeed, had his first taste of “viral” fame when he published letters from Nike refusing to print the word “sweatshop” on custom order shoes in 2001. Did you not want any personalization? Nike went on to launch a bespoke design store concept around NIKEiD. 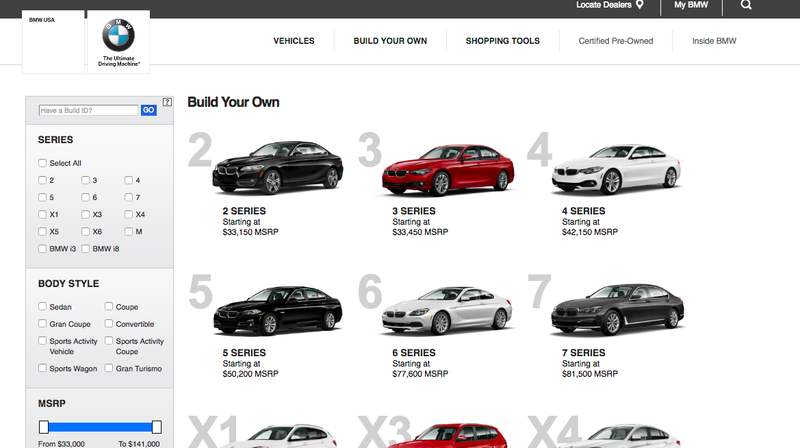 The great innovation of Dell was to let customers personalize the specifications of their computers; most car brand websites now let you “build your own” car. And so on. As the economy shifts from products to experiences, consumers want personalized ones. Marketing, in its broadest sense, embraced the age of personalization decades ago. The online advertising industry is based on a number of interlocking elements, which have conspired to diminish the experience for the user, abusing their privacy, patience and purse, increasing the advertising load per piece of content, whilst offering no additional value in return. 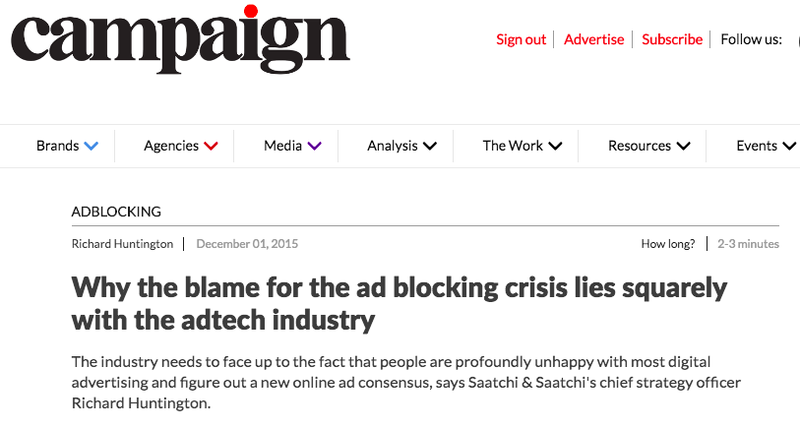 This is what has triggered the rise of ad-blocking. 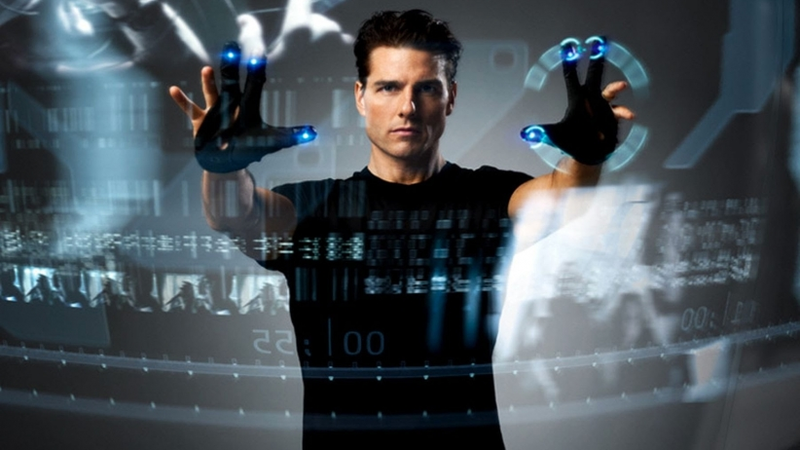 The key elements that make online advertising like the dystopia of Minority Report are the decoupling of media and advertising, through ad serving networks, and the invasive tracking that accompanies this. The first digital advertising banners were served by media companies themselves, but this changed due to what Cory Doctorow has called the ‘intrinsically toxic relationship between the three parties to the advertising ecosystem: advertisers, publishers and readers’. The lack of trust between publishers and advertisers created a new market segment, ad-tech, which most importantly includes third-party trackers. The tracker is an independent company that follows you and the ads around the internet. There is so much tracking code added to webpages that the amount of data downloaded when you pull up a single article from The Atlantic, for example, would take 15 old floppy discs to hold. All of this slows down the mobile web and costs you money in data charges. Our personal data are being bought and sold dozens of times a second on every website we visit, which has broken the traditional value exchange of advertising and pissed everyone off, especially in the age of PRISM, which uses this technology. According to a technical analysis by Rob Leathern, when you load the mobile version of the New York Post, your full IP address is given out nearly 300 times as dozens of tracking networks exchange information about you. All in the name of personalized advertising, which no one actually wants. The argument used to justify this is relevance. Any sufficiently relevant advertising is indistinguishable from news, as the adage goes. But this evades the issue of consent. When Amazon uses a collaborative filtering algorithm to show me books that people who buy the books I have bought also buy, there is an explicit relationship between me and the advertiser. It uses my personal data to create recommendations, often good ones, because it works inside a category or set of categories I shop, with consensual access to my prior behavior. 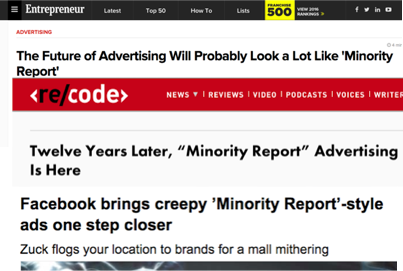 It’s the “creepy Minority Report” style ads that drive ad blocking: Personalized targeting that is obvious and visible to users, especially retargeting. Retargeting uses your web browsing habits to personalize the ads that you see, and people hate it in principle — and even more so when they understand how it is done. The lack of consent and the incredible increase in advertising load have created a tragedy of the commons: the scarce resource of human attention has been abused and is in danger of collapse. 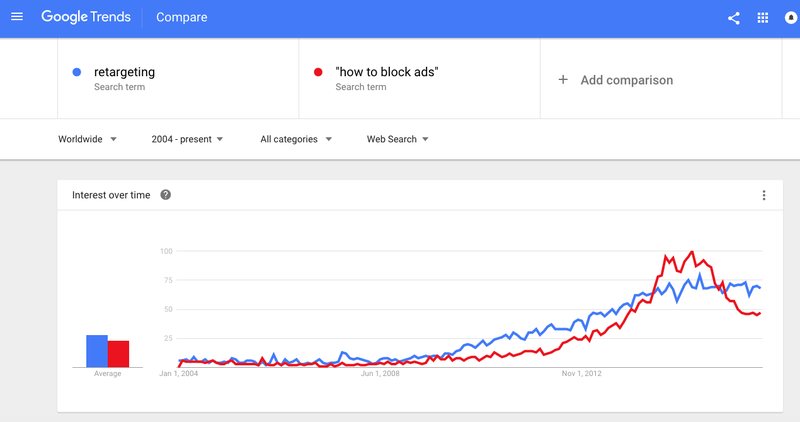 It was not the advent of online advertising the triggered the rise in ad-blocking, but the rise of invasive personalized targeting. What’s more, people’s acceptance of the value exchange of advertising, that it pays for or subsidizes content in return for access to your attention, degrades in parallel with how much digital advertising they consume. 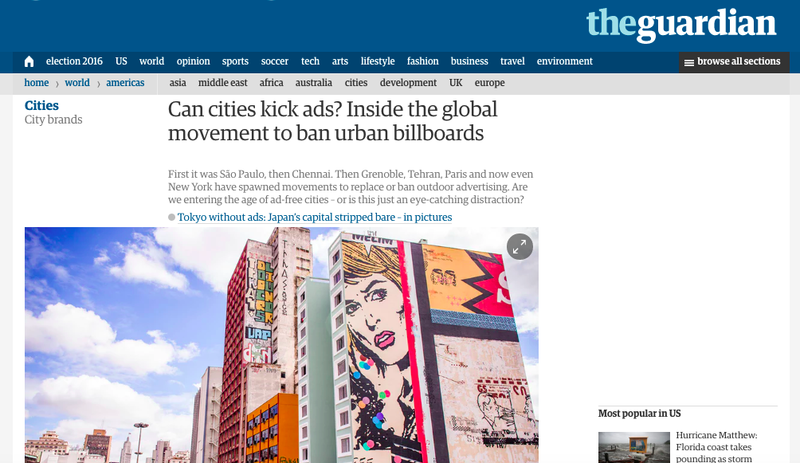 It starts with ad blocking, but then it seems to make sense to ban all outdoor advertising for the same reason, as has now happened in São Paulo and Chennai, in what has been called a ‘global movement to ban billboards’. Complete attention collapse is possible both online and outdoor, which are arguably the last remaining broadcast media. The rejection of personalized digital advertising has made the industry a laughing stock, at a time when we are struggling to win the war for talent against the more culturally salient technology industry. These arguments could be challenged if personalized advertising was demonstrably more effective, but it’s not. Like too many “rules” in advertising, it’s based on a prevailing set of ‘common sense’ principles, carved in stone, not in data. It’s like the car marketer who thinks that test drives lead to purchases and so uses much of its communication budget to incentivize or simulate test drives. Test drive incentives have become “a fun way to get a little stay at home mom income” and the sheer volume of virtual test drives created each year is staggering. Yet this is backwards. People who are going to buy cars take test drives, but making someone take a test drive will not make them buy a car. It’s a misunderstanding, created by the fiction of the marketing funnel, which suggests the wrong direction of causality. Equally, pestering people who have previously expressed some kind of interest in a product, whilst seemingly smart, is specious. It understands advertising backwards. We don’t see an ad and then run to buy something, you cannot annoy someone into a purchase, though we may buy a certain something, at some point, when we have a relevant need, because we all saw an ad. And, often even when we have bought something, we continue to get that thing advertised to us, based again on the seemingly sensible but often incorrect inference that this makes us a more likely purchaser of said product. “Mass marketing is actually more effective”. Let’s take Coca-Cola as an example. 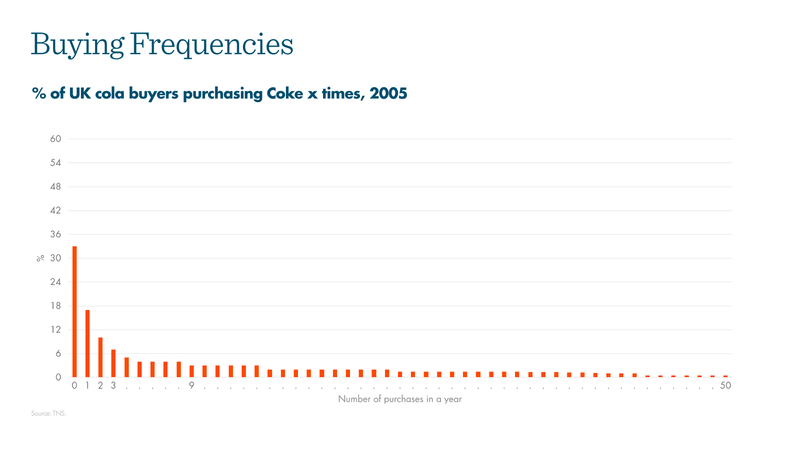 Their average buy rate is 12 per year but most people buy only one or two Coca-Colas per year. They do have some heavy buyers, people buying three Cokes a day, but very few of them. We can see that the bulk of customers were non or light buyers, getting just a one or two Cokes a year. Though light buyers may be purchasing only one or two Coca-Colas a year, they collectively add up because there are so many of them. Two decades of data from Nielsen and the IPA show similar patterns across a range of household products, consumer financial services, and cars. Your name is the most beautiful sound in the world. You hear it over the conversation at cocktail parties be cause it’s hugely important to you. But that doesn’t mean it should appear in ads, because this turns a cultural stimulus into a personal exhortation. That’s what I mean by saying personalized advertising is an oxymoron. Advertising with my name in it is selling, it’s direct marketing, and that’s not what advertising does. Rather it makes things sellable. It’s a confusion of tasks, a problem for communication strategy to untangle by understanding the appropriate roles for different channels. Seeing this ad on Facebook with my name all over it, for example, pulls me out of a social, cultural space and into a defensive mode of being sold to. 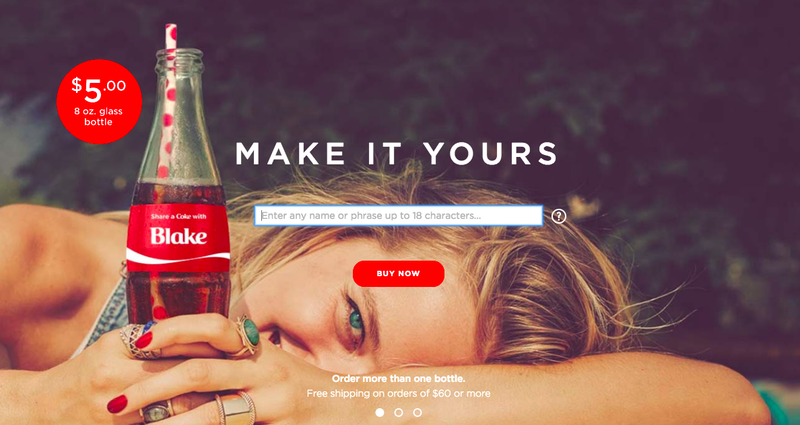 A more successful way of utilizing the power of names is Coca-Cola’s Share a Coke campaign. Beginning in Australia, and now globally, the advertising uses generic first names to speak to personalization, but the service allows you to personalize the products specifically, at a significant increase in cost, that people have been happy to pay. The snake oil sold to the advertising industry by the adtech industry was the idea of targeted scale, in essence the solution to Wannaker’s old shibboleth, that half the money spent on advertising is wasted, but that we didn’t know which half. 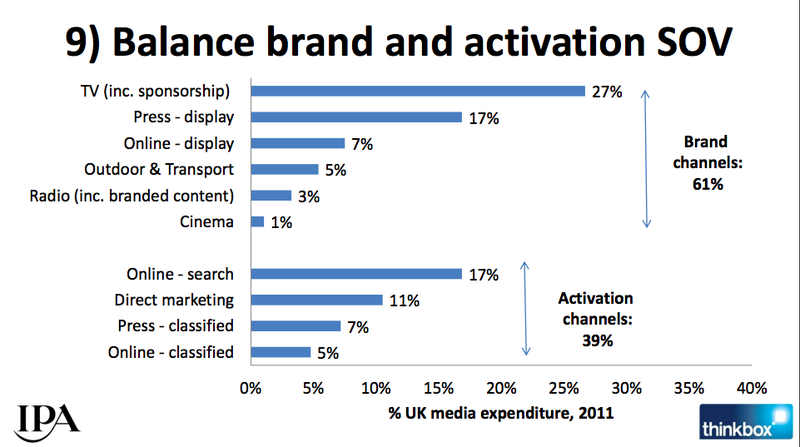 As Tim Ambler has pointed out, “advertisers should seek to increase wastage”. It is the cultural visibility and associated expense of advertising that creates a “reliable signal” of quality, not the claims made in them, which are too often exposed to be hollow by huge trust violations such as VW’s. The reliability of the signal is in direct proportion to the perceived wastage, so highly targeted personalized advertising is not fit for the purpose. 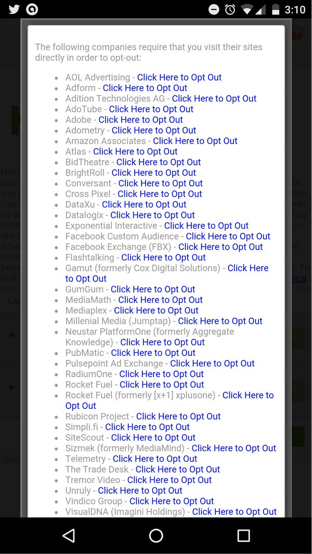 Personalized ads make it impossible to distinguish between a reliable signal and a cold call trying to sell me something, and no one likes cold calls. “Waste is good and precision can be bad. It’s another way of saying that brands can’t be built in a silo. The power of brands is that they are part of our collective conscience. Advertising is most effective not when it interrupts the right person at the moment of truth with the right message, but rather as a cultural and social stimulus to create mental availability, which is then (later) accessed by users when they come to buy. 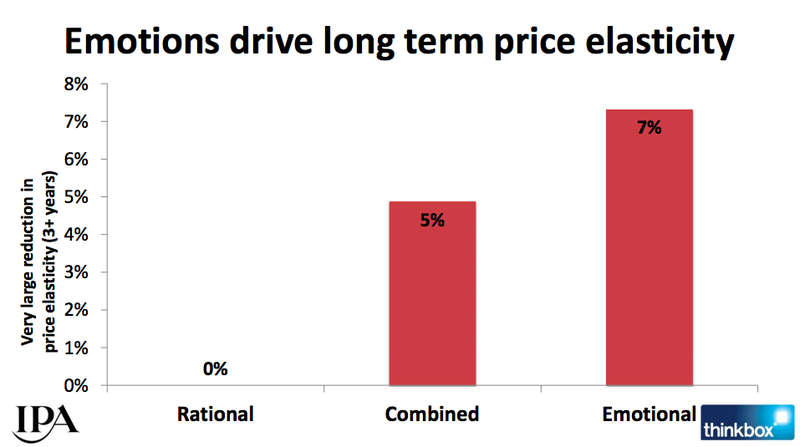 We need to re-focus advertising on what it is best at, building brands and imbuing them with emotion, which create price inelasticity of demand for products and services, allowing strong brands to command significant price premiums over time. The infrastructure and assumptions of online, personalized advertising are fundamentally wrong and have brought us to the brink of attention collapse. To solve this, advertising must re-engage at the cultural level, operate with consent, consider how it creates mass visibility and consumer acceptance, through a more balanced value equation. Brands should stop bleeding their budgets to death through endless ad-tech intermediaries in the quest for questionable impressions and concentrate on big, brand building creative ideas that can be deployed across channels, content engines like Red Bull’s Stratos. They also won’t play out inside retargeted banners. The mass customization of products and services are, and have been proven to be, the appropriate marketing response to the age of personalization, not personalized targeted advertising. Minority Report was a paranoiac dystopian vision of a fascist surveillance state, where your every move is tracked and you can be arrested for crimes you have not yet committed, and the advertising it highlights is a reflection of that. So let’s please not keep using it as a roadmap. Follow Context to stay abreast of the entire year-end feature and upcoming original stories from industry leaders in 2017. Adapted from an essay originally published in ADMAP, as a commended entry to the essay prize Feb 2016.